The Pakistan People’s Party-led ruling coalition obtained two-thirds majority in the Senate on Friday after winning 41 out of the 54 seats put up for contest, ending with the support of 74 members in the 104-member Upper House of parliament. Per unofficial results, the PPP won 19 seats of the Upper House to emerge as the single largest party in the Senate – for the first time after 1970s, taking its total tally to 41. Previously, the ruling party had 27 seats, but five of its members had to retire on March 12 and would have reduced the party’s strength to 22. With this victory, the coalition government has now majority in both houses of parliament. According to unofficial results, the ruling party grabbed 19, the Pakistan Muslim League-Nawaz won eight, the PML-Quaid, Jamiat Ulema-e-Islam-Fazl (JUI-F) and Muttahida Qaumi Movement (MQM) four each, the Awami National Party (ANP) seven, Balochistan National Party-Awami two and five independents, including four from FATA and one from Punjab, made it to the Senate. The win of Mohsin Khan Leghari of the PML-Q proved to be the biggest upset of the elections from Punjab, as the ruling party’s nominee Aslam Gill was defeated by four votes. ANP’s Daud Khan also surprised many by winning from Balochistan, but his win was result of a deal between the PPP and ANP which had only three members in the Balochistan Assembly and the PPP arranged at least seven more votes for him. The PML-N’s Nisar Khan Malakand also won a seat from Khyber Pakhtunkhwa, though his party did not have the required strength in the assembly. The PML-Q was the biggest loser in the Senate elections as it was reduced from a majority party to a minority party with 21 of its members of the total 22 scheduled to retire. However, the Q league also managed to grab another four seats in the Senate polls and took its number from one to five – thanks to the PPP, which accommodated its isolated ally. The MQM won four new seats. Its earlier strength was six senators, but three of its Senate members were due to retire. The Awami National Party (ANP) won seven seats, taking its total number to 12. It had six seats in the Upper House and Senator Alyas Bilour was the only ANP member to retire. However, Bilour was re-elected as technocrat. The PML-Functional also managed to win a seat as former Sindh chief minister Muzaffar Hussain Shah was elected to the Upper House. This would be his first election to the Senate. The PML-F has regained its lone senator due to retire on March 12. The BNP-Awami won another two seats to take its total number to four. Its president, Mir Israrullah Zehri, had to retire on March 12, but he was re-elected. The Senate election results showed that 74 senators, including 41 from the PPP, five from the PML-Q, seven from the MQM, 12 of the ANP, one from PML-F, four of BNP-A and four from FATA, were siding with the coalition government. Mohsin Leghari, the independent candidate elected from Punjab, has yet to decide about his future. The opposition got only 12 seats, with eight candidates winning from the PML-N and four from the JUI-F. The PML-N won eight seats in the Senate polls. It had seven senators and only Senator Ishaq Dar was to retire on March 12. However, Dar was elected unopposed and the PML-N now has a total 14 members in the Senate. The surprise win of Nisar Khan Malakand from Khyber Pakhtunkhwa (KP) reflected good homework, while the upset in Punjab, where the PML-N covertly backed Mohsin Leghari, gives an impression that there was some backchannel used between the Khosas and Legharis – the archrival groups – to defeat PPP’s Aslam Gill. JUI-F: The JUI-F won four seats. Previously, the party had 10 senators, but seven of its members were to retire on March 12, reducing the party’s strength to three. With the four wins, the total strength of the party would rise to seven. Independents: Four independents made it to the Senate from FATA and they are supporting the government. However, there is no word yet from Mohsin Leghari, who won as an independent candidate from Punjab. Federal Capital: From the federal capital, Mushahid Hussain of the PML-Q was elected unopposed on the technocrat seat, while Usman Saifullah from the PPP was elected to the general seat. FATA: Hidayatullah, Najamul Hassan and Saleh Shah won elections with clear majority from FATA. However, since Akhundzada Chattan and Maulana Abdul Malik did not cast their votes, Hilalur Rehman, Abdul Waheed Khan, Hameedullah Jan Afridi and Abdul Malik Qadri entered into a tie as all four got four votes each. Finally, Hilalur Rehman was elected after a draw. Sahibzada Abdus Salam Shirani and Malik Abdur Rehman could not get any vote while Munir Aurakzai got one vote. Sindh: In Sindh, Nasreen Jalil, Mustafa Kamal and Tahir Mashhadi from the MQM and Seher Kamran from the PPP were elected to the women Senate seats. Hari Ram Kishori Lal was elected to the minority Senate seat. While from the PPP, Mian Raza Rabbani, Saeed Ghani, Aijaz Dhamra and Dr Karim Khawaja remained successful. Muzzafar Hussain Shah from the PML-F was also elected to the Senate. Dr Abdul Hafeez Sheikh and Barrister Farogh Naseem have already been elected unopposed on the technocrat seats in Sindh. As expected, all three candidates of the PML-Likeminded could not succeed in making a “political upset” as their vote bank, apparently, remained confined to their party fellows, numbering four only. In total 164 members of the provincial assembly cast their votes in the 168-member electoral college for Senate from Sindh. Dr Ghulam Arbab Rahim of the PML-Likeminded and Waheeda Shah, Rashida Akhtar Panhwar and Ruqia Khanum Soomro of the PPP did not cast their votes, as the former chief minister was abroad, while the by-poll result notification of Waheeda Shah has been withheld. Panhwar could not participate in the voting because of her mother’s demise while Soomro is sick. The Provincial Election Commission (PEC) declared five votes invalid, three for minorities and two for women seats. Khyber Pakhtunkhwa: Rubina Khalid of the PPP and Zahida Khan of the ANP were elected to the women’s seats, while Amarjeet Malhotra of the ANP was elected to the minorities’ seat. Ilyas Bilour of the ANP and Farhatullah Babar of the PPP were elected to the technocrat seats. Shahi Syed and Baz Muhammad Khan and Azam Hoti of the ANP have been elected to the general seats, while Talha Mahmood of the JUI-F was also elected. 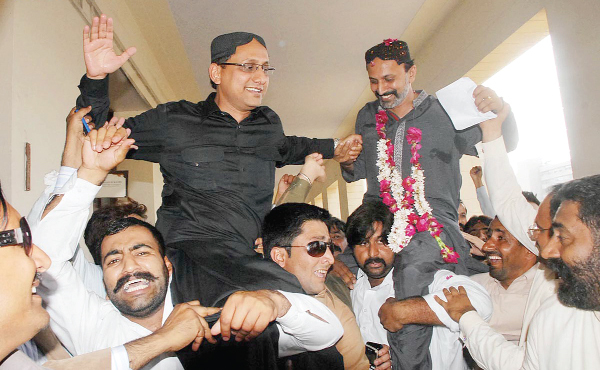 Saifullah Bangash, Ahmed Hasan Khan, Shamroz Khan Jadoon from the PPP were also elected. Nisar Muhammad Khan of the PML-N also won a Senate seat from the province. Punjab: In Punjab, the PML-N overshadowed its rivals – the PPP and PML-Q – as its seven candidates were elected to the total 12 seats from the province. Moreover, the PML-N was successful in giving the PPP a jolt, as Aslam Gill of the PPP was defeated by Mohsin Leghari of the PML-Q, an independent candidate being covertly supported by the PML-N.
Gill bagged 42 votes while Leghari, whose performance had been exceptional against the PML-N as a vocal opposition legislator, bagged 46 votes. PML-N leaders Sardar Zulfiqar Khosa, Rafique Rijwana, Zafarullah Dhandla and Muhammad Hamza were elected besides PPP candidate Babar Awan. Kamil Ali Agha of the PML-Q was also elected. PML-N MNA Nuzhat Sadiq and PPP nominee Khalida Parveen were elected on reserved seats for women. On the technocrat seats, Aitzaz Ahsan from the PPP and Ishaq Dar of the PML-N were already elected unopposed. On the minority seat, Kamran Michael of the PML-N got elected unopposed. During the polling, PML-N MPA Yasin Sohail tendered his resignation in protest against the insistence of Punjab Law Minister Rana Sanaullah, who reportedly asked him to show his vote before casting. However, after intervention by the chief minister, Sohail withdrew his resignation. Talking to reporters, Sohail said Sanaullah asked him to show his vote in order to check if he was following party policy. He said he had submitted his resignation to Chief Minister’s Principal Secretary Tauqeer Shah. Later, Rana Sanaullah persuaded him to withdraw his resignation. The Punjab law minister said Sohail had submitted his resignation to him and not to the Punjab Assembly speaker after getting a little emotional. Balochistan: In Balochistan, Saifullah Magsi and Sardar Fateh Mohammad Mohammad Hasni of the PPP, Hafiz Hamdullah of the JUI-F, Saeedul Hassan Mandokhel of the PML-Q, Mir Israrullah Zehri of the BNP-Awami made it to the Senate. Interestingly, Daud Khan of the ANP also won election despite the ANP having only three MPAs in the Balochistan Assembly and where it needed at least nine votes to win a seat to the Senate. Those elected to the general Senate seats in Balochistan include Mir Israrullah Zehri of BNP-Awami, Nawabzada Saifullah Magsi, Muhammad Yousuf Baloch and Sardar Fateh Muhammad Hasni of the PPP. Rozi Khan Kakar was also successful. Syedul Hassan Mandokhel and Rubina Irfan of the PML-Q, besides Hamdullah Saboor and Mufti Abdul Sattar Shahwani of the JUI-F also got elected. Naseema Ehsan of the BNP-Awami remained successful on the women seat from Balochistan, while the minority seat was won by Aman Das of the JUI-F. Results withheld: Late on Friday night, the Balochistan Election Commission withheld the results for seven general Senate seats after objections were filed by losing PML-N candidate Syed Nawab Shah. A recount would be held in Islamabad by the ECP, it was announced. Balochistan Election Commissioner Abdul Jabbar Jamali confirmed that a recount of votes for all seven general seats from Balochistan would be held in Islamabad. He said there were some objections raised by the PML-N nominee over the rejection of the vote cast by Sardar Sanaullah Zehri and against the announcement by provincial election commission that declared ANP’s nominee Daud Achkazai elected. He said the official result of all the seven general seats would be announced on March 5, after recounting in the presence of both candidates.